Hi, I have a macbook pro 2013 baseline with intel 6100 and an i5 8 gb ram. I can never get HF 4pro to work well- canon 15i footage barely plays well, and eve with 1 clip in the timeline, the clip sttters and drops frames. I haven't changed ANYTHING to the card, camera or the way I work. It just started getting slower and slower, since the last few edits I've done. The export time is the same... but the timeline preformance is unacceptable. What is wrong? why so sudden? I keep asking these questions to the forum and I never quite get to an answer that always works (clearly). I don't think this is what a program like this should be doing. T5i footage is in a highly compressed format not suitable for editing. You will greatly increase performance by transcoding your footage to a suitable editing codec. 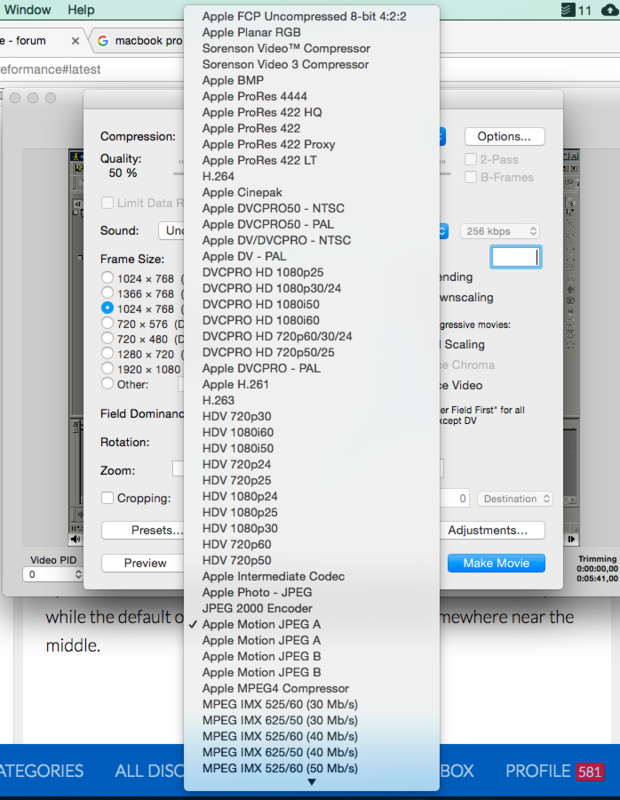 ProRes is the best option. This video is PC based, but goes into detail on "delivery" (T5i) vs "editing" (ProRes) codecs, and covers several transcode methods. MPEG Streamclip is a Mac option. I downloaded MPEG streamclip (latest, Mac), but when I open the export to quicktime settings, there's no option for prores! Wow! That's a much shorter list than I've got. Did you try that link and install the Pro Video Formats package? Yes, but that is only for final cut pro- it won't let me download it, since I don't have FCP. Also- I can us YUV422 but I think that's too much- a simple 1 minute video becomes 15GB! No way do I have enough storage for that even if I delete the editing codec level footage afterwards. MOD EDIT: Fixed image link. I was going to mention that @Aladdin4d but wasn't 100% sure since jsbarret said his worked without FCPX installed. No way for me to check because I have Motion, FCPX and the Codecs native. @GrayMotion I think we have success! If you ever have an extra $49.99 (one time) I'd strongly suggest you beaf up that Mac's video capablities of yours with Motion 5. YOU WILL NOT BE DISAPPOINTED. Glad to see you got the Pro Video Formats installed though. Rock on! @GrayMotion I never said I got it to install. I just said the download wasn't prevented, which the OP said was the problem ("it won't let me download it"). I've already got those codecs on my system (no idea how, but they're all there! ), so I didn't try to actually run the installation. @GrayMotion No worries. Just clarifying.